We have been holding off on this room update because it has been a work in progress for a while. When we began looking at houses here in AZ we found that a lot of them had theater rooms. Maybe it is because of the summer heat and people need a place to retreat or maybe we just live in a world of movie loving people, but either way it was a bit of a surprise to me and kind of made me giggle. After all, we are not a huge TV watching family and certainly did not need a theater room. Well, guess what? We ended up with a theater room. And it still makes me giggle. We retreat here most Friday nights for our family movie night and occasionally the older kids will watch something in the evening, but it really doesn't get much traffic. Regardless, it is a fun room and one I knew I wanted to make special. We finally settled on a simple approach to decorating. All six of us chose our favorite movie and then we ordered a movie poster for each of them, had them framed, and hung them up. DONE! Want to have a little fun? Can you guess whose movie is whose? All I still need is a big basket of theater candy for our viewing pleasure. Joseph and the Amazing Technicolor Dreamcoat- me! It is always a treat to review beautiful products and then be able to gift them to friends and family! So often the things we review are for personal use, usually homeschooling. Not that that is a bad thing, but it is often not as exciting. Ellie Claire Art Journals- now THOSE are exciting! Journals of this fashion are quite new to me, as I am not an art girl, per se. Oh, don't get me wrong, I love art, but there does not seem to be one ounce of art talent in my DNA. Sad, but true. But these beautiful art journals from Ellie Art Gifts, well, they will make even the most art ignorant person's heart happy. They are simply beautiful! The Faith and Lettering Journal is a beautiful hard bound journal meant to teach lettering techniques while you meditate on the Word of God. Some pages are full color illustrations of scripture verses brought to life with creative lettering, with a facing page ready for you to try your hand at it. Other pages are specifically teaching and practicing pages, whether writing complete verses or just practicing a specific letter style. Other pages have a small quote or scripture verse with a full page to be completely creative on. Here you can journal or practice more of your lettering art. Lastly, there are pages that teach and allow you to practice fun doodles, banners and flourishes, with the encouragement to practice 15 minutes a day. There is an elastic pen holder on the binder so you can always have a pen handy! Illuminate Your Story is the smallest of the three journals. This book begins with the history of the art of illumination and provides information on 6 different types. Information is also provided on Illuminated letters of ancient times, as well as a supply list you will need to get started. Step by step instructions are provided for each letter of the alphabet with room to practice. You will begin using a pencil and then add black marker and color. Additional pages have a quote or additional scripture at the top. Here you can practice your illuminated letters or simply use the space for journaling. Four special features of this particular journal are that it has a ribbon bookmark, an elastic band to hold it closed, an elastic pen holder on the binder, and a pocket in the back cover to keep additional keepsakes in it. The third journal, The Illustrated Word, is an illuminated Bible Coloring Journal, and has the most space for journaling. In it you will find beautiful miniature pictures of religious artwork on a journal page and then a full page black and white drawing for you to be able to color that picture or one similar to it. The pictures are labeled and would make a great mini study in art history! This one I am keeping for myself to take scripture notes in. The bindings of all three book are works of art themselves and allow you to lay the book open flat when writing or drawing in them. The pages are a thick paper that will not easily tear and hold a great deal of ink without bleeding through. We used pretty thick art markers when playing with them and did not have any problem. Since I admitted I am keeping one, where are the other two going? To two sweet, young lady friends of mine. Both are super talented and agreed to try the journals out for me before I sent them home with them. Take a look at what they did!! These lovely Ellie Claire Journals would make wonderful gifts for someone special in your life. They are perfect for any age and any skill level, as well as for someone who just likes to journal in a beautiful space. The journals are well made, beautifully illustrated, and will inspire your faith and grow your artistic talent. With each turn of the page and each scripture you meditate on, may you draw closer to the Lord! We love to read in our family! From a very early age we surround our kiddos with books and pray they will love them as we do. Thankfully, we have raised strong readers and lovers of books. It does this momma's heart good to see them snuggled on the couch deeply engrossed in their latest book adventure. Reading is also one of our favorite subjects in school since it involves, of course, BOOKS! Colby's current reading program has involved simply reading a book on the 6th grade reading list and writing a short paper after he finishes each one. Not very inspiring, but it was just what we did. When I had the chance to review a new-to-us reading program from Mosdos Press Literature, thanks to Timberdoodle Co., I was eager to see how we would do with a more classroom typical reading program. We have been working through this program for over a month now and I am excited to tell you about it! Mosdos Press Literature is a Literature and Reading program that has 6 levels. Each level has a unique gem name- Opal, Ruby, Coral, Pearl, Jade and Gold. We have been using the Mosdos Jade level which is intended for 7th graders. The set comes with a hard back student reader, a student workbook and a spiral bound teacher's guide in two parts. While not a specific Christian program..."Mosdos Literature is a complete literature program that does not glamorize evil, nor present subject matter that is not age-appropriate. Neither does it portray as normal a cynical disregard for positive values, but reinforces the universal ideals of courage, honesty, loyalty, and compassion." Gotta love that! Each selection ranges from just a page to more than several pages long. All of the stories begin with an Intro that gives you a summary of the story, the Focus which talks about the theme and gives you some questions to be looking for while you read, and a bit about the author. After the story you will find questions that recall facts and then some that are interpreting questions that make the student really think. There you will also find additional things to examine and think about, as well as a creative writing assignment you can choose to do. The student workbook then provides additional activities to further engage your student. Each story has two vocabulary activities which include fill in the blank sections, matching, and occasionally a crossword puzzle. Next you will find writing activities and then graphic organizing activities. At the end of the workbook you will find a glossary for your student to use for quick reference. The teacher's guide is pretty straight forward as well. Each page of the student's reader in pictured so you can follow along, and additional questions labeled Guiding the Reading are listed for you to be able to guide conversations on the reading. You will also find additional notes about the literary component you are currently studying to help you lead those discussions as well. If there is a workbook section that ties in to that particular part of the story, it is listed for your convenience. Colby was very excited to try this program. He is used to reading longer books and I think was excited to try some shorter selections. We typically read one story a day, with me first reading the summary and additional information. Sometimes we take turns reading but often Colby just reads aloud to me. The following day we answer questions and discuss the story in more depth. On the third day we do both vocabulary pages. On our final day, we choose one more activity to do, whether a writing assignment or one of the literature/grammar based graphic organizers. Because we are doing a separate writing program those are the activities we have chosen less often. We have really enjoyed using the Mosdos program and are continuing to use it this year as our primary reading program,. I have found that we enjoy the many different types of stories and reading together rather than Colby reading a long book for several weeks alone. It has been a sweet time of togetherness as well and has exposed us to many different types of reading materials we may not have otherwise chosen. A reading workbook is a new thing to us, but it has been a fairly easy transition. The vocabulary activities have actually been his favorite part and I love that were expanding his vocabulary easily. The activities have given him some new skills such as sequencing and character development. The writing assignments are good and offer lots of space for creative thinking and writing, as well as the teaching of research and dictionary skills. I have to say I was a little overwhelmed at first with the teacher's guide and the student workbook since those are not things we usually have. I am also used to a day by day schedule, but have learned to appreciate the freedom one has to pick and choose without one. I have been able to have Colby just do the worksheets I feel are beneficial to him and skip the others without the guilt. It is freeing! I also have found the value in the teacher's guide. I admit I often ask pretty basic questions on our reading just to check for reading comprehension, but then stop there. The questions presented in the teacher's guide are more in depth critical thinking questions and have been a good stretch for us to have. The guide is very public school oriented but can easily be adapted for a homeschooler easily. All in all, we are quite pleased with Mosdos Press Literature and are thankful we have had the chance to explore it. It is a positive change to our year and one we will continue to use. 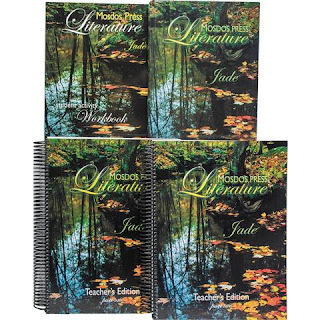 Mosdos Jade is part of the 7th grade curriculum kit from Timberdoodle, and can also be purchased separately. Art gets sorely overlooked in our house so when I get a chance to write a review on an art related curriculum I jump on it. Such was the case with the Master Kitz- The Starry Night from Kidzaw.com. What started off as a volunteer program at a local preschool, Kidzaw has turned into a growing business. They also offer Master Scultpz kits, Art on the Go and Color on the Go kits,as well as Art Parties. Reasonably prices and all supplies included, these art kits are a great way to teach about great artists and art history as well as art principles. The Starry Night kit includes two large pieces of heavy art paper, templates, acrylic paints, pastel oils, two paint rollers and detailed instructions. The front page of the instruction is dedicated to the instruction of who Vincent van Gogh was and what his art was about. Consider it a mini history and art lesson all in one. Facts include where van Gogh was born, how he became an artist, and how he created the style we now call Post-Impressionism. Did you know that in 1990, one of van Gogh's painting sold for 82.5 million dollars? Wow! As for the instructions, these fold open to reveal a 12 step process to create your rendition of The Starry Night. Each step is broken down in small parts and shown with words as well as colored pictures. My son, age 11 and in 6th grade, had no problem reading them and following them himself though I did sit beside him during the process. Colby is not much of an art kid either, so it took a little convincing to get him started on this project. I finally just pulled it out and told him we would try and if he hated it I would finish it by myself. Spoiler alert- I did NOT finish it by myself. As a matter of fact, I did nothing- he did it ALL. Yep, typical kid, huh? As soon as he opened the kit box and saw the cool rollers he was all in. Hey, whatever It takes! We immediately taped down the paper to our kitchen counter ( the instructions advise putting paper under but I knew our counters would clean up easily). We then opened all the bottles of paint and he began reading the instructions. Step by step we worked our way through the instructions, pausing only to wash our hands once or twice. All in all, the complete project took us about 45 minutes. Drying time is mentioned a few times, but it seemed that each time we were ready to start the next step the paint was dry enough to proceed. I thought Colby's favorite part would be the paint rollers, but as it turned out he loved using the pastel oils to customize the painting. When you follow the instructions there is not much chance for much variation. After all, you are trying to reproduce a famous painting. But in steps 11 and 12 you are encouraged to add some finishing touches using the oil pastels. We did take some time to talk about what we had learned about on the double page spread entitled The Style of Vincent van Gogh as we worked. Things like how up close the work may look blurred and much different that when you view it from further away. We also each took turns holding his finished piece further away to see if that was true in our case as well. Yes indeed, up close very few details are visible. We ended our project by hanging it proudly in our kitchen area where it can be seen by all who enter. Colby even asked if we could possibly frame it to hang up. Pride in his work-I would say that is a sign of a good art kit! You can watch demonstration videos and see more art from other kids on the kidzaw.com website! 50 other reviewers took advantage of this great opportunity to have their kids create a masterpiece. You can see their finished work and read their reviews by clicking on the banner below.